Makers of Melbourne grabbed marketing maestro Alvin for a photo from the line for Sydney photographer Giuseppe Santamaria's 'Men In This Town' book signing at the Henry Bucks flagship store on Collins Street. Alvin was dressed for the warm evening, wearing vintage loafers, H&M shorts, Prada bag, ASOS tee and vintage jacket. Chris always looks like the best dressed man in the room (or in this case, the street). The perfect personification of everything Melbourne tailoring brand Oscar Hunt stands for - no nonsense classic dressing without the fussy frills. 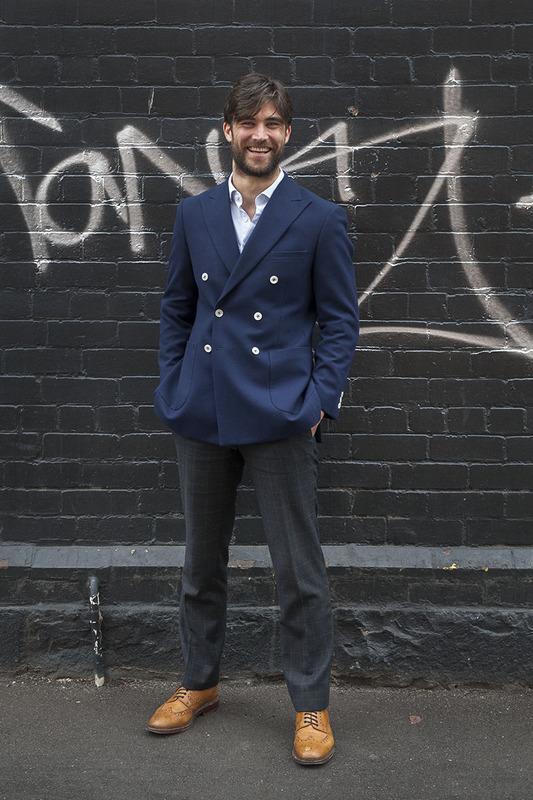 Chris was photographed in South Melbourne wearing Oscar Hunt trousers, shirt & double breasted jacket, finished off with a pair of tan derby brogues from Loake. It was hardly a surprise to learn that the stylish Jamie worked at the boutique of Japanese design company Kenzo. Well layered against the cool of a typical Melbourne Spring evening, Jamie interspersed his head to toe Kenzo garb with a pleated button-down from Erdem. Juliette, photographed in Federation Square wearing a David Bowie tshirt and vintage leather skirt. Jeweller at Metal Couture Maeve, photographed in Manchester Lane wearing ACNE jeans and shoes, Josh Goot jacket and vintage turtleneck. Even among the dapper gents at this year's Festival of Steve, a more casually attired Cardin still stood out as a guy assured of his own style. Makers grabbed a few shots just on dusk outside of Russell Street's iconic Kelvin Club of Cardin wearing an M-ONE-11 shirt, Bell & Barnett Jumper, Kenneth Cole shoes & Kangol hat. The Makers of Melbourne street style team stopped Andrew on a late Saturday afternoon in the Melbourne CBD. His Alfred Dunhill traditional leather holdall & the tailoring of his Balmain peacoat were dead giveaways that here was a man who appreciated quality, even when dressing for a casual day out. 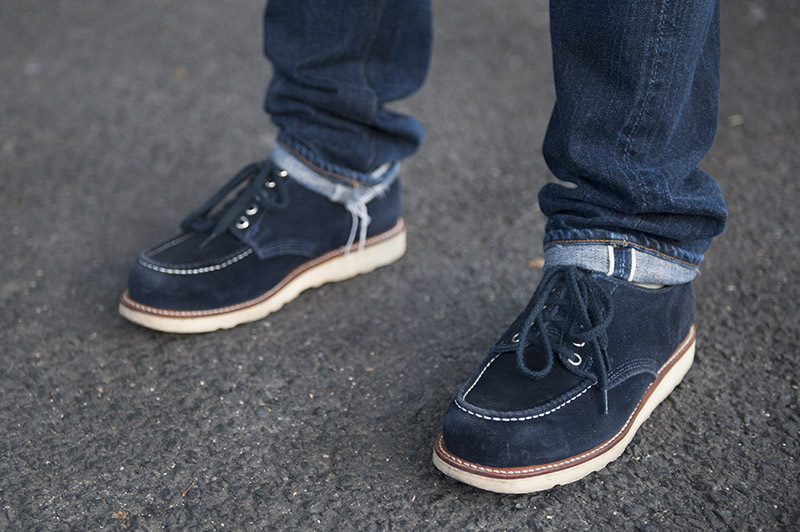 Andrew's leather & canvas boots were handmade in Istanbul by Helm & his jeans were from PRPS. Anthony Capon has been designing for Melbourne fashion label Et Al since 2008. The Season 2 Project Runway winning designer is the personification of what Et Al is all about - relaxed monochromatic tailored style that couldn't be the product of any other city but Melbourne. Anthony is wearing all Et Al pieces with the shoes a collaborative teaming of Rollie x Et Al. His vintage bowler hat was a gift from his housemate. Poetically, we photographed newest member of the Oscar Hunt tailoring family, Steve, outside of the men's event, the Festival of Steve. A walking personification of the easygoing style of the Oscar Hunt boys, Steve was unsurprisingly wearing the brand's own jacket, trousers & tie along with Pike Brothers braces, Loake brogues & a Filson briefcase. Makers of Melbourne grabbed Theo as he window-shopped on a sunny Sunday afternoon in Fitzroy. Wearing a mix of well chosen pieces, his weekend casual look was made up of trousers by Brent Wilson, tartan tee by sportswear brand Elwood, ASOS shoes, H&M scarf & jacket purchased on a recent trip to Europe. Joanna, photographed on Cecil Street, South Melbourne. Wearing a customised skirt purchased at a sample sale, blouse from Camberwell market, sunglasses from Moot, handbag from Scotland and plimsoles from Sportsgirl. Bosco is an understated guy. Softly spoken and not overly flashy, he's a stylish individual with an eye for classic pieces that marry well and are built to last. We stopped Bosco in South Melbourne where he shyly agreed to let Makers of Melbourne take his picture. His ensemble comprised a pair of New Balance sneakers, classic Levis jeans, Beams Boy scarf & Breton style tee by APC. Kieren was stopped by the Makers of Melbourne team as he left Fitzroy cafe 'De Clieu' & it soon became apparent that every piece of clothing he wore had special significance for him. From his vintage American Varsity jacket to his embroidered Mexican chambray shirt, there was a history to how each item had come to be a part of his wardrobe. New Zealand artist & friend Joe Sheehan had given three of only a dozen handmade Jade keys to Kieren as a gift, which he wears as a necklace on an antique fob chain. His outfit was completed with a classic 1960's Rolex, Japanese designed S2W8 navy suede moccasins & a pair of Flat Head jeans. While VAMFF (the Virgin Australia Melbourne Fashion Festival) runway series may have had a heavy focus on the ladies, there were still a number of male attendees at the Docklands Central Pier shows. Forget the dime a dozen navy suits - here are a few boys who, through sheer originality, stood out from the typical fashion pack. RMIT fashion designer teacher Dr Peter Allan in Japanese demin label 'Big John overalls & Levis jacket. Taylor in Topshop top, Thai sarong, New Balance sneakers, Alexander McQueen clutch. Jac+ Jack designer Jacqueline ‘Jac’ Hunt, photographed outside of the VAMFF fashion parades at Docklands. Wearing Jac+ Jack shirt, Issey Miyake skirt and Clergerie sandals. Nicole, Photographed outside of the VAMFF fashion parades at Docklands. Wearing Strateas Carlucci. 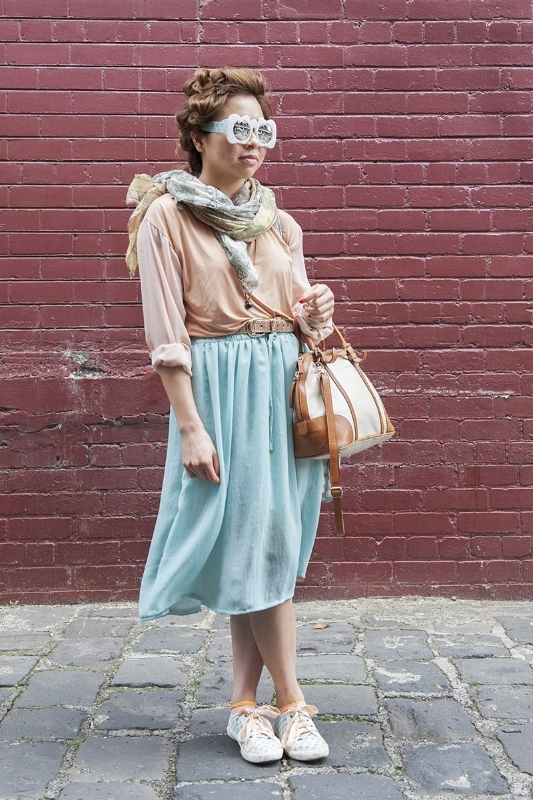 Dallas, photographed on Little Bourke Street wearing a top from India, Kinki Gerlinki skirt and silver shoes from Soles.